We have now fully updated our guide for Dublin (and Ireland). 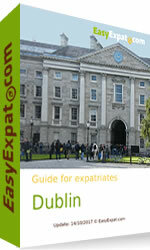 After London, Paris and Montreal, the guide has been fully reviewed and extended, and with 123 pages (PDF) of information you will read the most complete guide to prepare your expatriation to Ireland and to Dublin. Dublin is internationally noteworthy in terms of its vibrancy, nightlife and tourist attractions. Furthermore, it is also the most popular entry point for international visitors to Ireland and an economic, administrative and cultural centre with one of the fastest growing populations of any European capital city. Figures from the OECD (Organisation for Economic Co-operation and Development) show Ireland's economic growth to be approximately two to three times that of countries such as France, Germany, the UK and the USA. Another indicator called “Modified Total Domestic Demand” excluding aircraft leasing companies and imports of intellectual property has been develop and shows an increase of more than 4.5% in 2017. You can also discuss and share experience in Dublin and Ireland in our forum.